Some wonderful reads her Jacqui! Mr Norris and A Game of Hide and Seek are definitely high on my list for 2017. Wishing you a Merry Christmas and another wonderful reading year in 2017! Lovely – I can’t wait to hear what you make of them! I’ve just finished Isherwood’s Goodbye to Berlin and it’s just as evocative as its predecessor. One to hold over for next year’s list, I think. Wishing you all the best for the festive season too – may it be filled with lots of wonderful books. :) . There are so many on here that I’ve been meaning to read. I’m going to bookmark this and use it as a list – I’m determined to read more from my own shelves in 2017. Funnily enough, they’re the unread ones on my shelf! And Elisabeth Bowen. I want to read more of Joan Didion too. Hint taken, Rhys is top of the pile! I’ve only read a few of these, and the rest are all worthy choices. Thanks for sharing, and have an excellent Christmas. You’re very welcome, Simon. It’s been great to chat to you about books throughout the year – long may it continue. Wishing you all the best for the festive season – let’s hope it’s a good one. I love The Go Between and A Game of Hide & Seek. I’m not familiar with the others; shame on me! Thanks Jacqui for highlighting so many great reads. You’re very welcome, Sarah. The Go-Between is terrific, isn’t it? A quintessential summer read. Bonjour Tristesse falls into that camp too and might be worth considering if you haven’t read it already. I’m hoping to read Sagan’s A Certain Smile next summer . A lovely list, Jacqui. Based on the ones I HAVE read I really need to try the ones I haven’t, as I loved all the ones I know! Fantastic. Here’s hoping you’ll find some new favourites for the future – I know you enjoyed revisiting Isherwood this year. By the way, I’ve just finished reading his Goodbye to Berlin, which I LOVED – I’m going to hold it over till next year! Yes, Isherwood such a sure-fire treat for any year! Indeed. I have A Single Man to look forward to as well. Such an interesting list, Jacqui, and very timely for me – I finished Dorothy B. Hughes’ The Blackbirder last week and had been wondering which Hughes to move on to. Thanks, Susan. Glad to hear you enjoyed The Blackbirder. I’ll have to try it in the future. In a Lonely Place is brilliant – such an atmospheric novel, full of psychological tension and suspense. I hope you get a chance to read it. Wow this is a fabulous list. I have read eight of them over the years. A Game of Hide and Seek I re-read just a couple of weeks ago. I also have the Philip Larkin tbr bought following your enthusiasm for it. The only Isherwood I have read to date is Goodbye Berlin, perhaps I need to explore more. Merry Christmas to you Jacqui I hope it’s peaceful and book filled. Thanks so much, Ali. Elizabeth Taylor is pretty much guaranteed her own slot on my ‘best of’ list these days, so I’m delighted you encouraged me to read her – I definitely owe you for that! The Larkin is beautiful and I feel sure you will enjoy it. Wishing you all the best for the festive season too – I hope you have a restful one. I really enjoyed reading your posts this year Jacqui. You read some great books. May 2017 be great year for reading. Thanks, Brian. Likewise, it’s been good to follow your reading choices over the year – you always bring something interesting to your reviews of the classics. Have a great Christmas and New Year. Wishing you all the best for 2017. I’ve read two of these – Excellent Women and Miss Pettigrew, I enjoyed them both. They linger on long after they’ve been re-shelved. I’ve been wanting to read Grand Hotel for a while so thank you for the reminder. And I’ve just added Death of the Heart to the list. Thank you for sharing. Have a peaceful Christmas and a literary new year. You’re very welcome. So glad to hear you liked Miss Pettigrew and the Pym. I agree with your thoughts on their staying power – while they might seem quite light and humorous at first, there’s actually quite a bit of depth/insight under the surface (especially in Excellent Women). I thought The Death of the Heart was outstanding, and I really hope you enjoy it too. Have a wonderful Christmas, Rosie – wishing you all the best for the year ahead. I enjoyed Voyage in the Dark and was lead to it by you and enjoyed reading it during Jean Rhys week! And Bonjour Tristesse I read this year too and delighted in it, a fabulous novella, I would like to read the French version and see how that compares. I lved The Year of Magical Thinking when I read it and funnily enough I just started reading a bit of Blue Nights which I plan to finish over Christmas, kind of in a theme of books about mothers, having read Jeanette Winterson’s memoir, Jeremy Gavron’s memoir and now another of Joan Didion’s . Looking forward to your reading list and reviews for 2017 Jacqui. I recall your evocative review of Voyage, Claire, and it was interesting to see your take on it especially when viewed alongside some of the other cross-cultural literature you’d read in the past. Bonjour Tristesse was such a treat, the perfect summer read. Fascinating issues surrounding the translations too – I think I’m going to have to try the Irene Ash version at some point next year (I was hoping to squeeze it into 2016, but somehow it doesn’t feel like a winter book!) I’m curious to see what you think of Didion’s Blue Nights – I have a copy here, so it might be one for next year. Very much looking forward to reading your review of that one. Have a lovely Christmas and New Year – all the best for 2017. What a great list! I really enjoyed Grand Hotel too. And Miss Pettigrew lives for a day is sitting on my shelf. Hoping to get to that one in the new year. I hope you enjoy your holidays, Jacqui! Thanks, Melissa. I think you will love Miss Pettigrew. It’s a wonderful pick-me-up book – and I mean that in the best possible way. I hope you enjoy the holidays too, Have a great Christmas – lots of lovely books, I trust. Those are lovely choices, Jacqui – several books there I love myself. I really must get to some more Bowen in 2017! Of them all I find myself most intrigued by the Larkin. I’ve read the Bowen, which I loved, and dipped into the Didion, which I must read in toto. Pym and Taylor are two authors I have to get to soon. I have at least one by each somewhere, I think. Great list. Hope you have a great christmas and I look forward to following your reading in 2017.. Thanks, Seamus. I think you would like the Larkin. Certain parts of it reminded me a little of Hamilton’s Slaves of Solitude (which I adored), while the mid-section felt somewhat reminiscent of Hartley’s The Go-Between. Technically it’s not a perfect novel, but I loved the mood and characterisation so much that I’m prepared to overlook its little imperfections. I feel sure that you will enjoy both Taylor and Pym – they’re not a million miles away from Muriel Spark, which can only be a good thing! I hope you have a wonderful Christmas, too. Are you planning to do a round-up of your reading highlights for the year? Hope so – I would love to see what you’ve been up to! I’ve read just two of these, but mean to try Pym and Bowen in the new year, plus read more from Taylor. I’ll keep your recommendations in mind. That’s great. Barbara Pym’s novels are an absolute delight, one of my best ‘discoveries’ in recent years. She is so good when it comes to observing human nature in social situations. I do hope you enjoy her work. There are only a very few I haven’t read yet but, luckily, I’ve got those I haven’t on my piles. Since I loved all of the books in the list that I’ve read, I know I will not be disappointed when I read the other ones. It’s a lovely list. That’s really great to hear. Which ones do you have to come? Miss Pettigrew? (Such a delightful book, you’re sure to fall under its spell.) I know you’ve read the Taylor as I recall your fondness for it. In fact that novel made its way onto my tbr list as a direct result of your lovely review! Yes, Miss Pettigrew, The Go-Between and Excellent Women. Quite the trio. Oh, no worries at all. I need to head over to yours to see what you’ve been up to lately. The Elizabeth Taylor is definitely worth considering. As per usual her charcterisation is excellent – even the secondary characters feel fresh in my mind eleven months down the line. Here’s hoping you have a great Christmas and an even greater Hogmanay, Jacqui — and keep up the good work! As you must know, I always enjoy your reviews. Ahem. Which are the blacklisted ones? Thank you. And likewise on both fronts – your film reviews are always a joy to read. Wishing you all the best for the festive season, John. I’m sure I’ll be adding lots more of your recommendations to my watch list in 2017! Voyage in the Dark is the only one of your books of the year I’ve read – and that was very much thanks to your influence. I’ll certainly read A Game of Hide and Seek at some point as Elizabeth Taylor is on my ‘read everything’ list. I think next from your choices would be Isherwood – maybe next year! PS I can only encourage you to read Isherwood. Recently finished Goodbye to Berlin, which I loved – it’s just as evocative as its predecessor. Happy Christmas, Jacqui. Read on, read on, and damn’d be he who first cries, Hold, enough! Well, you can expect more of the same in 2017. More Taylor, more Isherwood and definitely more Pym – what a delightful discovery she has turned out to be for me! Ha. Well, I’m certainly an incurable romantic, that’s for sure. Would it surprise you to hear that In a Lonely Place, Casablanca and Brief Encounter are three of my all-time favourite films? I suspect not! Wishing you a very Merry Christmas, too – all the best for the year ahead. I’m glad to see that some of the books and authors I’ve enjoyed made your list for 2016. I love Barbara Pym and Elizabeth Taylor, and I’m currently reading Jean Rhys’ ouevre and letters. Miss Pettigrew is wonderful – did you see the film adaptation? I thought it was pretty good. Have you read The Lonely Passion of Judith Hearne, by Brian Moore? I re-read it recently and thought of you. It seems like the sort of book you’d enjoy. I haven’t seen the film adaptation of Miss Pettigrew, but it’s definitely on my list of things to watch. Frances McDormand is one of my favourite contemporary actors, so I have high hopes. Really glad to hear you enjoyed the movie, that’s a relief to hear. Funny you should mention Judith Hearne as I do have a copy, a beautiful NYRB edition with the most gorgeous cover imaginable! It’s sitting on the shelves at home just waiting to be read. I feel sure I’m going to love it too. A spot-on recommendation, thank you. Wishing you a very Merry Christmas and a Happy New Year, Violet. All the very best for the year ahead – lots of wonderful reading, I hope. Great list! I loved Excellent Women, and Miss Pettigrew is one of my all-time favorites! I also read Grand Hotel this year and really enjoyed it. I’m happy to have discovered your blog, I think we have a lot of books in common. That’s great to hear! Grand Hotel was wonderful, such an entertaining array of characters from different walks of life. And I loved the way Baum used plenty of light and shade to give the story some texture – that really made it for me. So glad you enjoyed it too. Such an inspiring list, Jacqui (and more than a few of these have landed on my bookshelves thanks to your reviews). 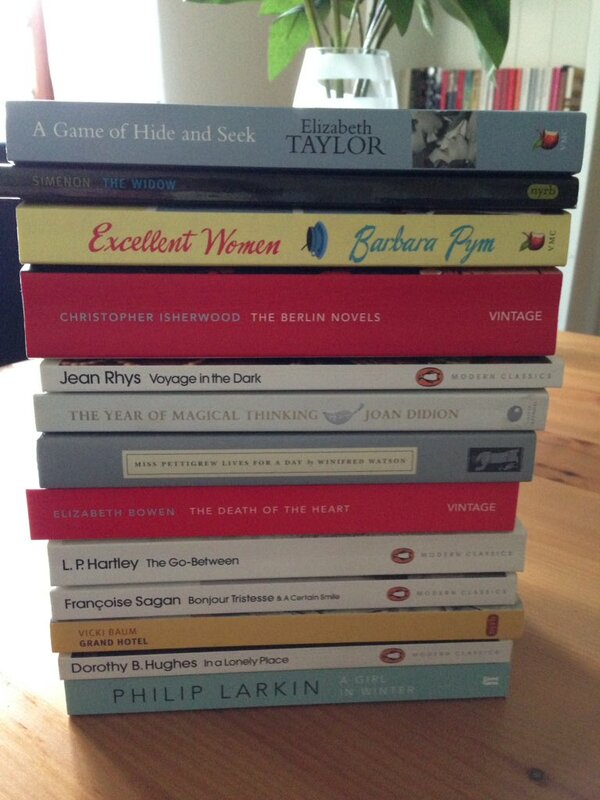 I plan to tackle the Elizabeth Taylor soon, and also have The Go-Betweeen sitting here on the night table. You’ve had quite a great reading year! Are you planning to pull something together on your reading highlights from this year? I know you’ve had other things on your mind these last few months, but it would be great to hear a little more about some of your favourites. Wishing you all the very best for festive season and the year ahead. I’ve read quite a few of these so I can appreciate your choices for the year. I think I prefer A Game of Hide and Seek over Mrs. Palfrey too. In some respects, it’s hard to compare them as the two storylines are quite different. Either way, Taylor’s a brilliant observer of human nature – the way she captures people in their private moments is really quite remarkable. Did you read her a View of the Harbour? Not yet, but I definitely plan to – I recall you liking it a lot. It’s on my Classics Club list, so maybe next year. It’s my favourite of the ones I’ve recently read. In a Summer Season is excellent too, though. This is a fantastic list Jacqui, so many great reads. Great to see Pym, Didion and Rhys making the grade, true giants of literature (even if not appreciated as such). Thanks, Belinda. It’s been a great year for me on the reading front. I read another Pym earlier this month – Crampton Hodnet – and it’s an absolute hoot. One to write up over the holidays, I think. Thanks to you, I spent a wonderful time with Miss Pettigrew. I loved Grand Hotel too. Françoise Sagan is a writer like a lot. She was so young when she wrote Bonjour Tristesse. Thanks. I’m looking forward to seeing how you find Magical Thinking. It’s all the more powerful for not trying to be (if that makes some kind of sense). Isn’t Miss Pettigrew just wonderful? I think I’ll read it again at some point, just as little treat. It;s good to hear that you rate Sagan – I’m planning to read A Certain Smile next year, probably over the summer. I agree about the Dorothy Hughes – really evocative of that era and very enjoyable. Sadly, I decided to explore her backlist and came across two of the most absurd books I’ve ever read – avoid ‘The So Blue Marble’ if you can. Oh, that’s sound advice – thank you. The Expendable Man seems to be very well regarded, so that might be my next Hughes. Great list Jacqui. I have to add many to my TBR. Especially Elizabeth Taylor. I have not heard of anyone who disliked her books. I surely must read her. I’ve been reading your blog all year but its lovely to have this reminder of the books that made it onto my TBR or my wishlist because of you! Thanks, Lisa. I really hope you enjoy those books – let me know how you get on. Merry Christmas to you as well. You’ve given me some great ideas for my own list! and some that I should revisit, since, for example, I loved “In a Lonely Place” and “Voyage in the Dark” so much.I read all of Jean Rhys in my early twenties, and would probably have some different perspectives now. Cool. It’s interesting how our responses to certain books or writers can vary depending on our age and experiences in life. I wonder what I would have made of Elizabeth Taylor’s novels had I read them back in my twenties…their subtleties may have been lost on me at that age! Thanks, Elena. I do love a good vintage noir so the Dorothy B. Hughes fitted the bill perfectly. The Year of Magical Thinking is excellent – hard to capture in just a few sentences, but it’s definitely worth reading. Wishing you all the best for the year ahead. I’m afraid it’ll make me cry, as it deals with such a difficult situation… Others have told me it’s sad, but there is hope too. What do you think? It’s incredibly powerful in a quiet, measured way. In some respects, it’s all the more moving for not trying to be if that makes some kind of sense. I think you have to be in the frame of mind to read this – it’s not one to pick up if you’re feeling a bit low or vulnerable. Overall, I’m very glad I read it, but I had to pick my time. Hope that helps. Great list and pleased to have found your blog. Some of these are on my Classics Club Challenge list for 2017 as I’m concentrating on women writers. Thanks. Oh, I’m glad to hear that. Quite a few of these were on my Classics Club list as well – it’s been a really useful way of encouraging myself to get around to some of these backlisted titles. I feel sure you will love Bonjour Tristesse. Save it for the summer as it’s the perfect sunny afternoon read. Happy New Year to you as well – wishing you all the best for 2017! Thanks, Alice. I hope you get a chance to try one or two of them. Happy New Year to you as well! Thanks, Poppy. I found these modern classics so much more rewarding than the handful of contemporary books I read last year (mostly for my book group). Maybe it’s a function of my age or a change in tastes,,,who knows. Glad you enjoyed the Rhys week – it was fun, but lots of work! I’m glad that you had such a good year reading, Jacqui, as quite the opposite was true for me. I’m still sad that your Jean Rhys week came and went, when I had planned to join in after first hearing about it. I enjoyed Miss Pettigrew Lives for The Day, and Bonjour Tristesse, when I read them years ago, but most of your list is new to me. You always find authors I have not yet read, which opens doors I didn’t even know were closed. Thanks for your great posts, and your faithful comments, in 2016. Oh, you’re very welcome, Bellezza. I’m sorry 2016 wasn’t such a good year for you on the reading front – here’s to better times ahead in 2017. No worries at all about the Rhys week. You can always read her some other time. Her books have a certain timeless quality as the emotions she expresses are just as relevant today as they were back in the 1930s. Funnily enough, I was just thinking about you earlier today in relation to your annual Japanese event. I loved Natsume Soseki’s The Gate when I read it towards the end of last year. Is it a book you’ve read by any chance? If not, I think you might like it. My review is here if you’re interested. A lovely list indeed. I’m glad I didn’t read it before writing mine as it would definitely have influenced me. We have a fair bit of crossover (though not all from 2016) which doesn’t surprise me. I’ll be bookmarking a few of the others (did you particularly recommend the Bowen to me at one point?) for future reference. Really glad you liked the Isherwood in particular. I felt a bit protective towards Mr Norris too. Cheers, Max. I owe you a massive thank you for Mr Norris as it was your review that encouraged me to buy The Berlin Novels in the first place. (Ditto Brophy’s The King of a Rainy Country, which I also loved.) Funnily enough, I read Goodbye to Berlin in December and I think it’s got a pretty good chance of making my highlights for 2017. (As I still need to write my review, it’ll count as part of this year’s batch of books – otherwise things will start to get too complicated). I’ve also read another Taylor (The Soul of Kindness) and a Pym (the wonderfully named Crampton Hodnet) both of which I’d be very happy to see on my end-of-year round-up next December. All being well, I’ll be writing about them later this month. Yes, I did recommend the Bowen to you. I think it’s a masterful novel. My only worry is that I may have started with her best, or at least one of them. Her debut novel, The Hotel, is right at the top of my TBR, so I’ll see how I fare with that. Out of interest, which of the others are you thinking of bookmarking? I think you’d love In a Lonely Place, and Pym’s Excellent Women would be a good bet too, as would the Spark. Right, I’m off to take a look at your list now – well, probably a little later today as I want to give it the time it deserves. Delighted to hear that we have a few books/authors in common – hopefully some points of difference too, then I can pick up some tips for the future. I had fun putting my list together as it’s always interesting to reflect on a year’s worth of reading. Happy New Year to you too, Naomi – wishing you all the best for 2017! The good news is that of all the books on your list I’ve only read the Simenon, so I have a lot of new choices to select from. The bad news is that I–alone, seemingly–didn’t really care for The Widow even though I was loathe to part with the book afterward because it had such a great cover! Is there another Simenon you’d recommend to me? I’m ready to give him another try sometime soon, but he wrote so many novels I’m not sure where to start. Help! Ha! The cover of the NYRB edition is fabulous, isn’t it? So dark and alluring, I’m afraid I’m not going to be much use on the Simenon front as this was only my second experience of his romans durs! My first was Three Bedrooms in Manhattan, which I liked but didn’t love – the story was based on Simenon’s real-life relationship with Denise Ouimet, a woman he met in Manhattan in the 1940s. I wouldn’t say it was one of my favourite reads, but something about it did get under my skin at the time. What about his Maigret novels? I’ve read a whole bunch of them as they’re useful palate cleansers between heavier things. Pietr the Latvian (the first in the series) would be a good one to try. Happy reading, Richard! Very interesting list! I haven’t read or even heard of most of the books mentioned here, which is really refreshing. The only one I read (and liked a lot) some years ago was ‘Bonjour Tristesse’. Now I am super tempted to read ‘The Go-Between’, ‘Grand Hotel’ and ‘In a Lonely Place’. Thanks! If you liked Bonjour Tristesse, then I would definitely recommend The Go-Between and the Hughes as the Sagan shares some similarities with both of these books. Grand Hotel is wonderful too, especially if you’re in the mood for something entertaining with plenty of light and shade. I hope you get a chance to read one or two of them.